Marco Vandoni at Ocean Independence brings news of a further €100,000 price cut on his central listing, the 23.85m motor yacht Megalia. Delivered by Sanlorenzo in 2000, Megalia sleeps eight guests in a master suite, VIP stateroom and two twin cabins while twin 1,400hp Caterpillar engines give her a crising speed of 23 knots. 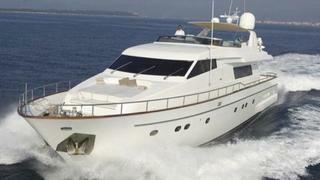 Lying in Naples, Italy, Megalia is down from €1,050,000 to €950,000, VAT paid.